Originally I had a dream to create a research establishment that would create and build new forms of energy generating devices that would power and empower individuals into the 21st century. Unfortunately as time goes by and with out the finance required,I am beginning to doubt that this will become a reality. This internet site and other websites that come under the energy21 banner, that I have created seems the next best option and putting there what information, that I have gathered over the last twenty years seems to be the thing to do. I have tried to contact the original copyright holders of this material, and in most cases have received their permission to reproduce their content here at this website. Please send me an email website owner and subject to proof of your claim I will remove it from this website. It is my hope that others can make use, of what information I have been able to gather and perhaps others may still be able to make use of some of it, and stop yourself from re-inventing the wheel and the mistakes of previous past experiments and experimenters. Much of the material reproduced at this website is incomplete and further research and experimentation in to the workings of our natural and cosmic world environment may still be needed to make the dream of free energy for all a reality. I also personally cannot vouch for material reproduced as I have no working knowledge of it apart from whats reproduced here. Some articles may also be totally worthless but, I am leaving visitors to this site to make up their own mind abouts this. This material however is included as a matter of interest. It is interesting to note, that when I started energy 21 and our other websites about five years, there were only three other websites that dealt with free energy,and now its really great to see this number has increased over the years as the interest has increased, no doubt in some part due to current high cost of energy generation and supply we are now forced to pay. I still believe energy21 is the only major Australian Website,dealing with free energy and to a lesser extent others forms of energy and giving the information away freely as well. We are also becoming aware of the work of Astro network in this field in South Australia and Victoria.Best wishes guys. We would welcome becoming aware also of other Australians and Australian websites dealing with these new forms of energy research. Here's how you can help me and Energy21 by doing one or more of the following. Download our major contents links url in a zip form from Energy21 Webpage Contents Links unzip the file in a separate folder and you will have a direct link to all information I have placed on the web. Give copies to family friends and interested workmates. Download the five zip copies ( floppy disk size ) of the smaller shareware version of the Encyclopedia of Free Energy and give copies to your friends and interested people alike. Placing a message in signature file of your email telling about this Energy21 Website is an excellent way to inform others about energy 21 as well. Open your eyes to World of Nature around you ,I believe all secrets will be found to reside with nature and we are too blind at the moment to see it,It is possible you have discovered something that others have not ,please share your discoveries with us. This website is always seeking new content ,if you have any please share it with us and the other fellow seekers who search this site for information to guide them in thour common quest,please include html code ,gifs,jpeg ect and send as attachments to. I have received some financial donations in the past and could do with extra additional funds, if you feel what I am trying to do at this has been of some benefit to you,and thus enable me to defray some of the expenses encountered in bringing this project to the world, via this site and the Internet in general. My only other source of income is usually only enough to cover some of my Internet connection costs ,and that is from the sale of the Encyclopedia of free energy CD. Finally I would like to express my thanks to those that have sent material that is reproduced at this website,and to those that have purchased the CD in the past and to those also that have also sent some financial support. 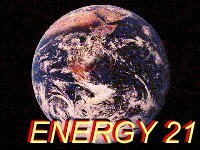 My aim is to make energy21 website the best and most comprehensive resource for others interested in the energy field and thus make a contribution others of this world can benefit from. To do this I will need the support of others.